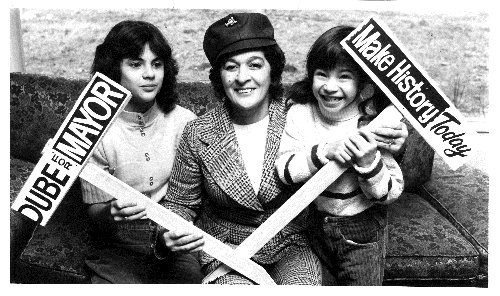 Betty Dube and her daughters in November of 1973. Betty Dube was born in Montreal. She married a Canadian soldier during the Second World War, but he was killed just a month before their son Greg was born. When Betty came to B.C. in 1951 to visit an aunt, she married a veteran and built a house in Whonnock. With her husband Romeo, she began caring for children in 1954 through a Children’s Aid program. Betty was widowed again c1969. Betty served as an alderman in Maple Ridge from 1969 to 1970 and again from 1972 to 1973. She served as mayor from 1974 to 1975, and later became a school trustee in Maple Ridge. She resigned a short time later saying she could not be productive within the established structure. 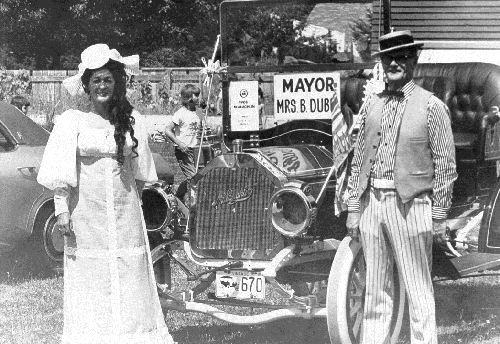 Mayor Betty Dube with the owner of a 1908 Canadian made automobile judged best vintage car in the 1974 Fall Fair parade. She was back on the scene during the provincial election in 1990, helping none other than Norm Jacobsen, the man who defeated her for the mayor’s chair in 1975. Betty was a grandmother of three, mother of five, and foster mother to more than 350. She was also a devoted volunteer for the hospital auxiliary.